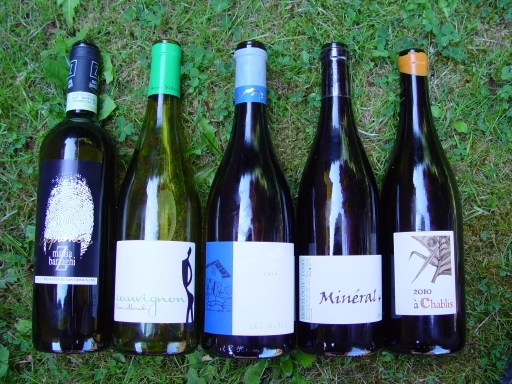 Less than a week after wine lovers daarn saaf were enjoying RAW and The Natural Wine Fair, a few of us oop north were doing our bit to better understand what natural wines have to offer. My methodology was to ask Les Caves de Pyrène to suggest a mixed case for a tasting, leaving them to define the term how they wanted and send me a representative sample. These wines were not review samples, but paid for in the normal way – in this case, effectively by the local tasting group I belong to. In addition to the wines tasted and described below, the Occhipinti 2011 Bianco and Rosso were also suggested and purchased. We kicked off with five whites. The empties are shown above on our 100% herbicide-free lawn. Then we moved onto the reds. These were also double-decanted not long before the tasting to take the wine off all sediment I was expecting from these possibly unfined and unfiltered wines. It turned out there was very little sediment. Polishing off the remains the following evening confirmed to me that the Loire Sauvignon and the Vin de Savoie were my favourite whites. 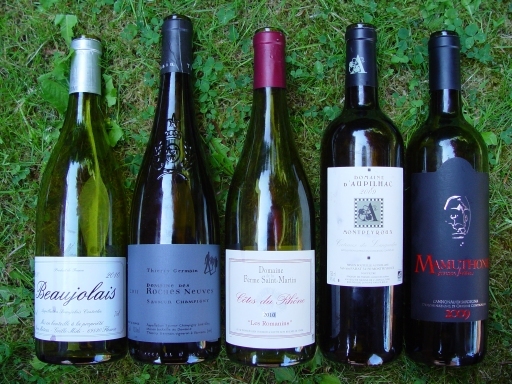 And the fact that all the reds apart from the Côtes du Rhône disappeared on the night of the tasting shows which wines were the most popular amongst the whole group! As far as I can make out, all of these wines were made from organic or biodynamic grapes, fermented by ambient yeasts, and with minimal sulphur additions. All labels bore the “contains sulphites” text, but that could required for the low levels of sulphur that result solely from the fermentation process. I did not experience any of the natural wine horror stories occasionally mentioned by others – everything we tasted was recognisably wine, and definitely not slightly fizzy cloudy cider. The only faulty bottle was the Mountlouis, and to be fair there were those at the table who enjoyed that too. The Côtes du Rhône was a tad bretty, but for me it was at a level that added to rather than diminished the overall experience. Oh, and there was one wine (can’t remember which one) that had obviously undergone some secondary fermentation in the bottle as it let off a fizz when I opened it, and was initially a bit spritzy, but by the time we got round to tasting it all signs of pettilance had gone. Really, I don’t think the absence of faults was too surprising in that I suspect the winemaking was not that different from the vast majority of what I would consider to be good wines. Generally speaking, the wines seemed to go down well at the tasting. One comment I got was that the wines were “gentle” – no hard edges. I certainly thought they were enjoyable, but I was not sure about the idea propounded by some that natural wines allow the terroir (or the grape variety, depending on who you speak to) to shine through. I was getting a lot of flavours that I am feeling were probably due mainly to the natural fermenation. If we had tasted blind, I would have struggled more than usual to identify varieties and regions. That certainly has a positive side – if I had to trade typicity for interest, I would go for interest most of the time. But even I sometimes like to know what to expect when I open a bottle. This entry was posted in My tasting notes and tagged biodynamics, natural, organic. Bookmark the permalink.